Food systems fail hundreds of millions of underserved consumers and business entrepreneurs around the world. There is a huge opportunity before us to harness talent, innovation and technology to build inclusive food systems for the future. Twelve-year-old Lena is growing up poor and malnourished on Chicago’s West Side. She buys Blue Juice and Hot Chips from the corner store on her way to school. She and her classmates can afford the flavoured sugar water and salty starch, but this cheap “food” that fills up her stomach provides no nutritional value. Lena is one of over 20 million Americans living in food deserts, places without access to a full-service grocery store within two miles. Yet while Lena buys her Hot Chips, an affluent family nearby uses an online retail platform to order their weekly delivery of fresh, nutritious food – at prices that Lena and her family can’t afford. Despite a surge of technology innovations in food retail, Lena and her family represent a growing number of underserved customers around the world. Across the globe, in Abuja, Nigeria, Amina sells tomatoes in the local market to feed her family. Without access to cold storage, whatever she doesn’t sell each day goes to waste. Local entrepreneurs recognize an opportunity. Olayemi has a startup that integrates renewable energy and digital technology for small-scale cold storage units, addressing food loss for poor market vendors while generating jobs and growth in the sector. But Olayemi is struggling to attract large-scale financing. Investors are wary of the high-risk agriculture sector, uncertain about an untested entrepreneur, and cautious about a projected customer base of small vendors like Amina. In fact, food startups around the world attract only one-tenth of the investment of those in the health sector. And so, Amina’s tomatoes continue to spoil in the hot sun. These stories illustrate at least two missed opportunities. First, food systems fail Lena, Amina, Olayemi and hundreds of millions of other underserved consumers and business entrepreneurs around the world. Second, poor, underserved communities are not being seen as a potential profitable market for business and innovation, but rather as cases for philanthropy or government safety net programmes. 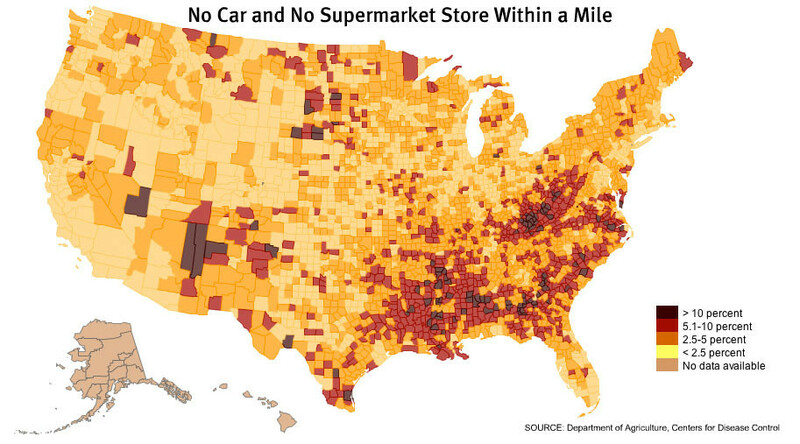 Food deserts in the US. We live in an age of abundance. Our technologies have unprecedented capabilities. Creative business innovations abound. Entrepreneurs like Olayemi are fuelling and disrupting markets across the globe. Yet, as retailers refine the grocery shopping experience for online customers, nearly 1 billion people, like Lena, cannot afford the food they need for a healthy diet. Smart devices, such as Internet of Things tools for agriculture, allow more affluent and larger farmers to manage farming risk more effectively, while climate change continues to disproportionately and severely impact food availability and accessibility for the world’s 500 million smallholder farmers. The food safety technologies we take for granted in the developed world are far from standard in developing and emerging markets. Put simply, we are not directing the power of innovation and technology toward market opportunities among the underserved and the poor. But the mandate is too urgent, and the opportunity too large, to ignore. Vast market potential remains available, offering solutions to address food system failures – a financial gap that the Business and Sustainable Development Commission valued at $2.3 trillion. And with agriculture currently in last place among sectors for digitization, there is immense untapped potential for leapfrog innovation, especially driven by our new, digital generation. How can we turn the tide, directing investment and innovation to build inclusive and sustainable food businesses for the future? We think an answer lies in working with and through market-based players, from startups to large companies, enabling new models of tech-enabled innovation designed with, for, and by underserved communities. Admirable pioneers have set this transition in motion, such as the entrepreneurs behind the Daily Table, Digital Green and Hello Tractor; investors like Acumen, Omnivore and the Omidyar Network; and those accelerating and informing agri-food entrepreneurship like Food-X, Food System 6 and AgFunder. Changing our food system, and the entrenched patterns and powers that perpetuate it, will take a concerted collaboration and fresh creativity. We are creating a new enterprise, Food Systems for the Future (FSF), to accelerate this transition. Working directly and through partners, FSF aims to increase investment and innovation in market-based activities, working with entrepreneurs and businesses of all sizes with the ultimate aim of reaching poor communities through inclusive, sustainable business models. It will combine capital with acceleration, policy advising, partnership development and continuous open-source learning. FSF will seek to complement others’ efforts in this dynamic space, bridging funding gaps through a blended, catalytic investment fund while working with community-level partners to develop an enabling environment for addressing food systems challenges among the underserved. Together, we can write a new story for food systems. We can leave behind Lena’s Blue Juice, Amina’s rotting tomatoes, and ensure Olayemi has the opportunity to build a thriving business. This starts with re-thinking the myopic, charitable mindset that perpetuates their challenges. Perhaps Lena will grow up to join a large company and expand its portfolio of healthy, low-cost products. Perhaps Amina will create a local brand of tomato sauce, developing an innovative sourcing model among her fellow vendors. Perhaps Olayemi will find a trusting investor and build a billion-dollar, tech-enabled business, transforming the cold chain across Africa and beyond. There is a huge opportunity before us to harness talent, innovation and technology to build inclusive food systems for the future. Let us seize it.